The ultimate in UV firepower, this 400 Watt UV cannon and high pressure bulb create the most powerful wash of blacklight we've seen. 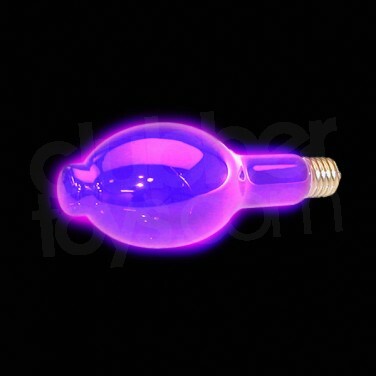 Just flip the switch for high powered blacklight illumination, powerful enough to illuminate dance halls and night clubs! 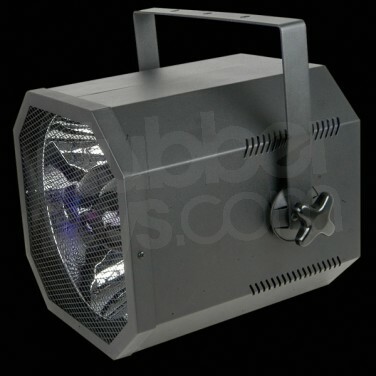 Don't be mistaken, this is a professional lighting unit that kicks out intense black light designed to wash large areas in UV light and make your UV products glow. The unit itself is huge, featuring a large parabolic reflector to spread the glow and a strong adjustable mounting bracket for ceiling mounting. The front is covered with a safety grille to keep hands away from the powerful 400 Watt, high pressure blacklight bulb (one included). If you need to illuminate every UV item in the room, this cannon is the UV light for you.